Saturday night Matt was exhausted from getting up for the farmer’s market, so I was on baby duty the entire night. It was a long one – somebody decided to do some cluster feeding and fussing – but we got in sleep when we could. When I woke up and fed him at 7, I brought him to Matt (who had gotten 8 hours of blissful sleep) and we traded rooms so I could take a 1.5 hour nap. When I woke up at 9:30, it was time to get ready for brunch! 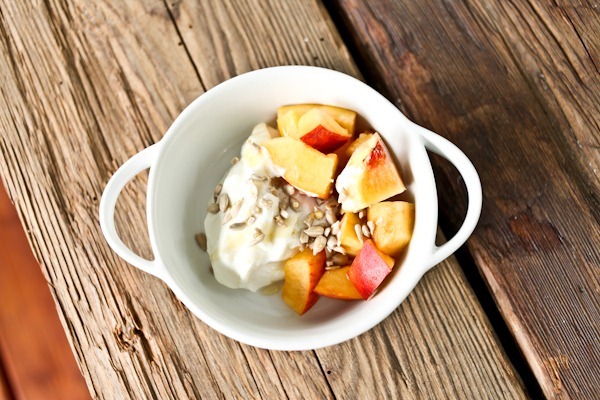 I had a small snack to tide me over – yogurt with peach and sunflower seeds with honey. I couldn’t wait to try out the stroller again! The walk was great – a crisp September morning! Mazen wanted to eat first, so I fed him at the table under my cover. 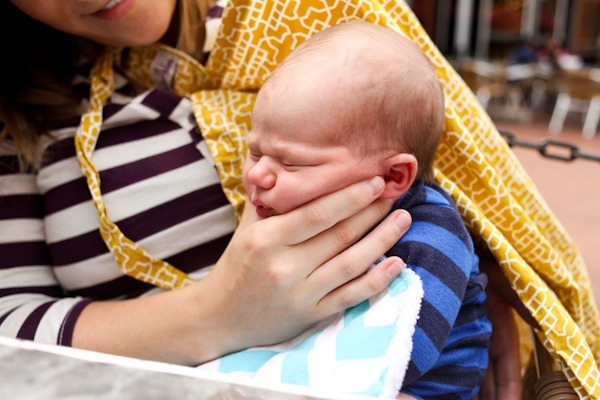 Now that breastfeeding is less painful, feeding him is getting easier. Our meal was incredible and I couldn’t wait to get my hands…er mouth…on a big Belgian waffle! This was sooooo good smothered in fresh fruit, whipped cream and maple syrup. Back at home, Matt and I said farewell to my family and settled into an afternoon of laundry, trash disposal and naps. We did 4 loads of laundry – 2 beds to sleep in = double the linens! I also got in an hour nap that left me disoriented it was so long! For dinner we reached into the freezer for one of my stocked meals – wild Alaskan salmon burgers. These come frozen from Whole Foods and were delicious on Rosemary Garlic rolls! Really easy and very tasty!! After our dinner and the baby’s, we went out for another walk! It was FALL CHILLY outside and I wore a fleece!!! Amazing. I am thrilled that [for now] Maze loves his stroller. He goes to sleep almost immediately, although I questioned if it’s fake sleep because the moment we get home and the jiggling stops he wakes right up! It’s a tough life for little Maze! Actually, it is since he missed out on those salmon burgers! That big hat on his head in the last picture is so funny and cute! I agree! His little hat does not even touch his little head! 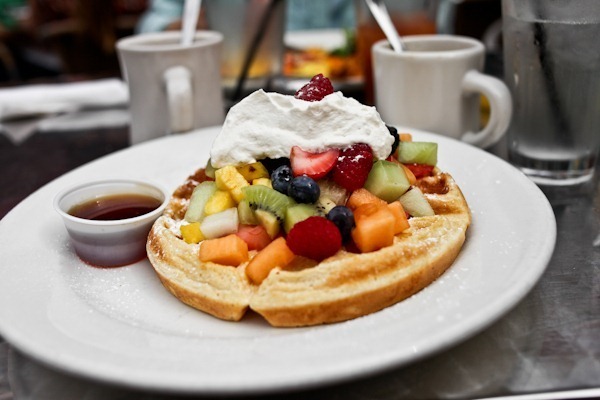 OMG Matt’s eggs Florentine look tasty, and that waffle covered in fruit…YUM! Good to see you are getting in to the groove of going out with Mazen, and that is two public feedings now (not counting the drs office)? You are doing great! That chalk wall amazes me! How cool. 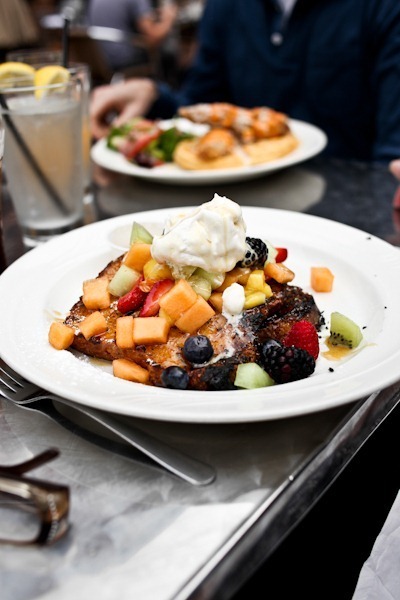 And all of that fresh fruit on your waffle looks to die for! Love Mazen’s adorable knitted hat! Too cute! I love fall chilly! I’m sitting in a sweatshirt with the doors and windows open and just LOVING it! What’s in your wet bag if you haven’t started cloth yet? I think you will love them. I do. I saw on twitter you asked what detergent – we use All Free & Clear on all our laundry, clothes and diapers! It works well. Sometimes you have to go through a lot of trial and error and troubleshooting but it is so worth it. There are some great cloth diaper blogs out there. Oh, interesting. Why don’t you just throw them out when you change him? I’ve never really seen someone do that unless maybe while you are out. 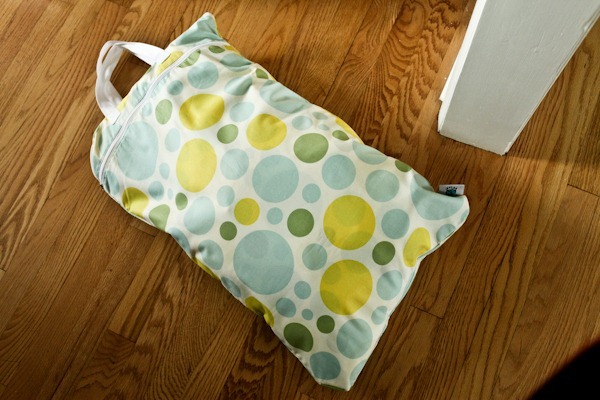 We had a Diaper Champ when we did disposables – it uses regular kitchen bags so no special inserts and no smell! Cloth diapers rock and Mother Earth thanks. Hey Kath, don’t forget that when you end up starting cloth, feel free to ask me if you have any questions I own a blog about cloth diapers, so I’ve heard just about every question and I get GIDDY helping people out. Not that cloth diapering is tough, but like Helen says, washing can require a little troubleshooting. But once you figure it out it is easy peasy! Thanks Tara! I bought some Rockin’ Green to have when I’m ready. I think my biggest question is what setting do I wash them on? I have a very simple washing machine – it doesn’t have a fancy sanitize cycle or anything. Do I need to run them twice? If you just have a blog page on this, I’ll go look for it! I hope that helps! But of course you can always contact me if you have any additional questions. And I am loving all your posts about new motherhood. I’ve read you for years, so it is neat to see you in this new role! Looks like you are a natural. He gets cuter every day!! That breakfast looks unreal!! 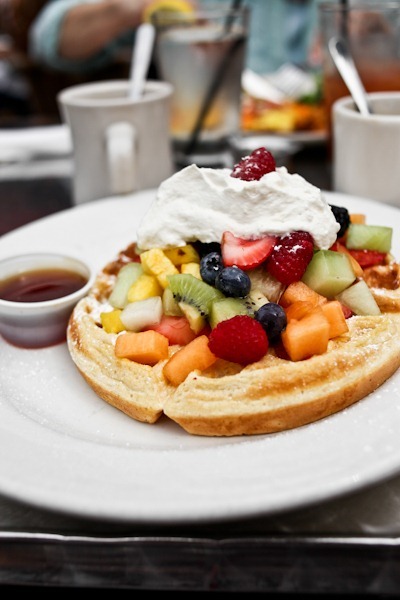 Love all the fresh fruit on the waffle. Sounds like an amazing whirlwind weekend Kath! I’m so glad things are settling in! Love that burp gorilla face! He is so sweet! 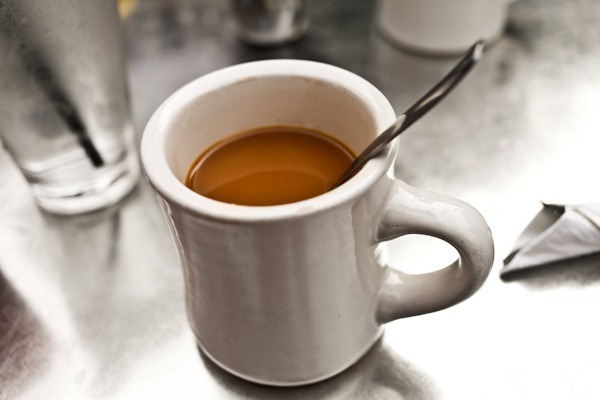 I hope you have a great Tuesday! Kath- You look amazing for having give birth such a short time ago!!! 1) That baby gets more adorable each day. 2) Now I want waffles. 3) Girl look how TINY you are! Did your dad come? If so, tell him he needs to get in on the art of photo-bombing — we need to see more of his smiling face! And congrats on the blog thing you posted about last night, Kath – it was really cool to see your enthusiasm and passion for the subject shine through. I agree, love the family stripes (you, Maze, your sister)! Oh my god he is so adorable, I love the blue hat!!!! Also that waffle looks to die for! Good choice! I recently went to a concert and the performer talked about the good sleep on a touring bus, how it rocks him to sleep, and what wakes him up is the stillness when they stop–maybe I’ll see Mazen in concert in a few years?!? awwww his little face is so cute! And that waffle looks amazing! I used cloth from day one because we didn’t have good disposable way back then. They were big but with proper folding they worked fine. I did not have a clothes dryer then either. We could barely afford the washer after many nights spent at the laundry mat doing diapers with the baby wearing the very last one. So I hung the diapers on a line outside when possible and inside on a rack if not. I got my first dryer 13 years later, when I went to work and the kids didn’t always get the laundry in before it rained. Times sure have changed. Some for the better, some not. I’m back to hanging clothes out on the line again. Yes, one of the main reasons I do it now. I’m retired now and can be here to take them in, if it rains. Climbing into a bed with just off the line sheets is almost euphoric for me. I would worry about pollen getting all over my clothes/sheets! My allergies would not be happy. 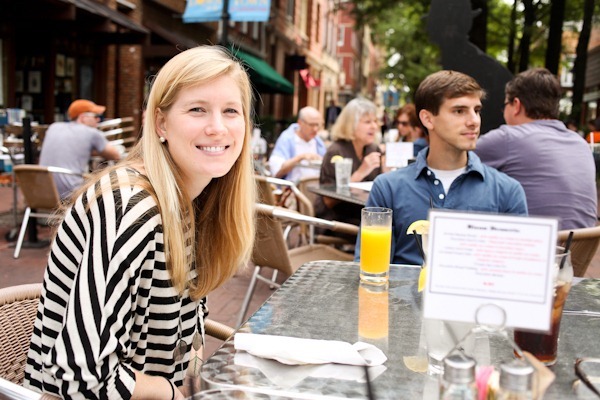 How funny– we had the exact same Bizou brunch the previous Sunday when my sister and brother-in-law were in town! 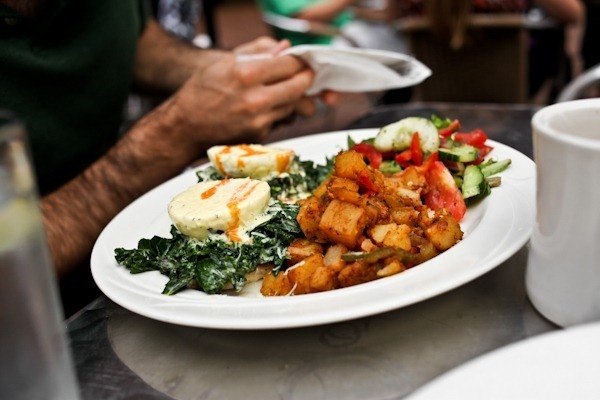 I had the eggs florentine and Del had the waffle–both were delicious! You look so wonderful and happy! 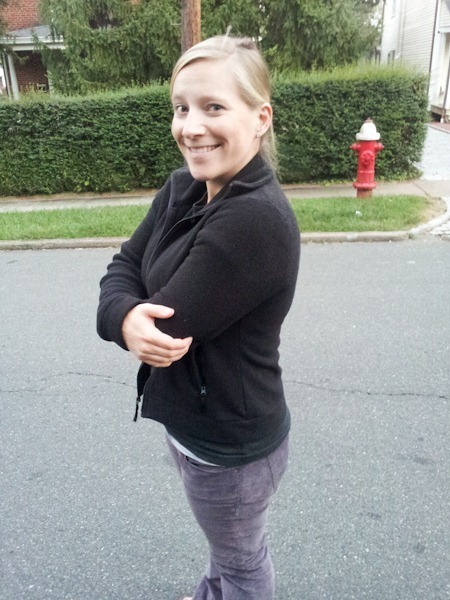 Random, but I love your corduroys – where are they from?! 1. You look absolutely amazing. Seriously! 2. That chalkboard art is awesome. 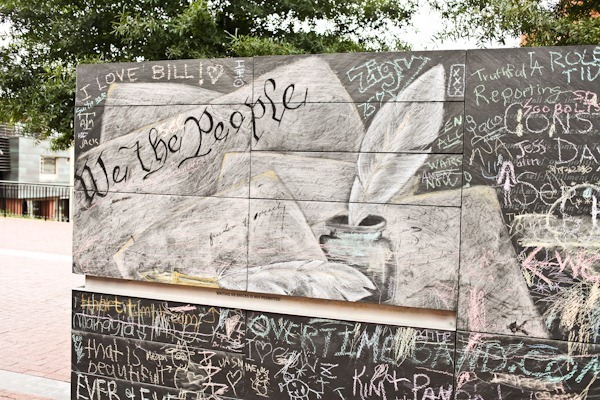 Is that just a chalkboard downtown that people can draw on or something? 3. Those salmon burgers sound delicious. And oh yeah, Maze looks like a wonderful baby. Looks like he loves to sleep! 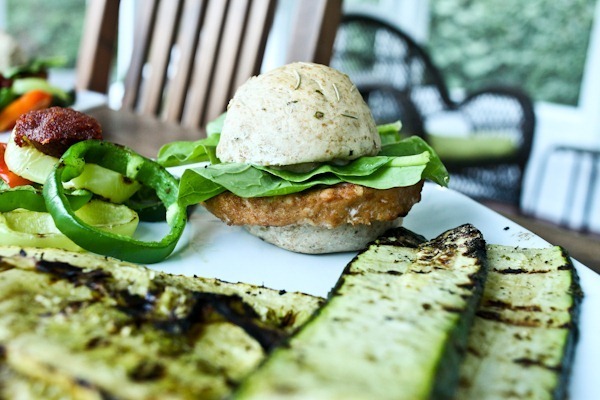 Rubbing zucchini in pesto is genius, that looks so good! and your 2 bedroom idea is great, that way one parent is well rested and functioning so the other can nap! Maze is absolutely beautiful…he is precious.You look wonderful,all that walking you did while pregnant really helped keep you in shape..Enjoy your Blessing..being a Parent is the best..
It’s amazing the color than is in our everyday stuff. Your photos are great and I love your son’s name. What does it mean? I found your blog through the 60 Must Read list from Greatist. Good work. great job getting out with maze! we went to bizou as our first date night with august when he was 1 week old too. there is definitely a great window of opportunity to take them out when they are little and sleep. i need to get over to meet him. missed you at pump. we did calves and i thought of you! 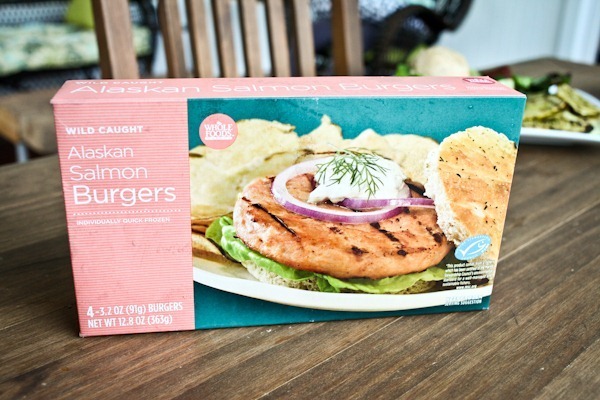 Those salmon burgers sound amazing! I’ve been obsessed with diaper bags and stollers since I was a little girl playing dolls too! You look GREAT by the way! And that Belgium waffle…..no words…. I love that you guys have been getting out and about with Mazen! I’m sure he loves checking out his new town : ). You do look absolutely incredible! A great example of how healthy living can help you to bounce back after baby. 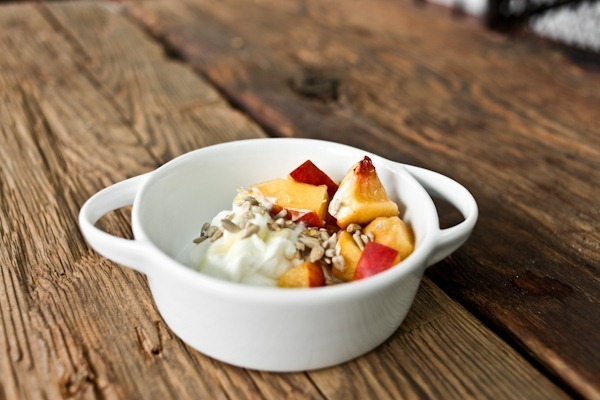 The food inspiration is good too! So are you guys going to use the Bugaboo and the BOB stroller? 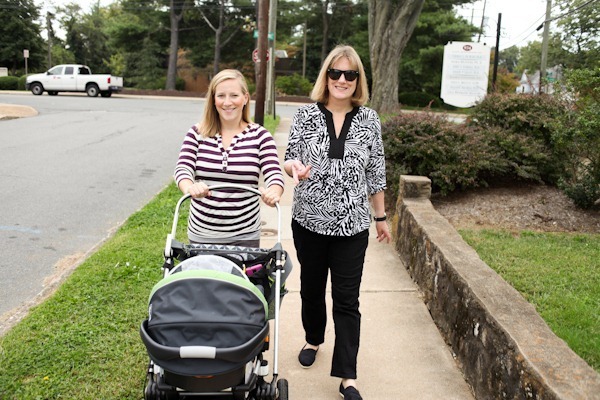 What made you feel like the BOB was the right stroller for you after all of your research? Thanks! Yes. 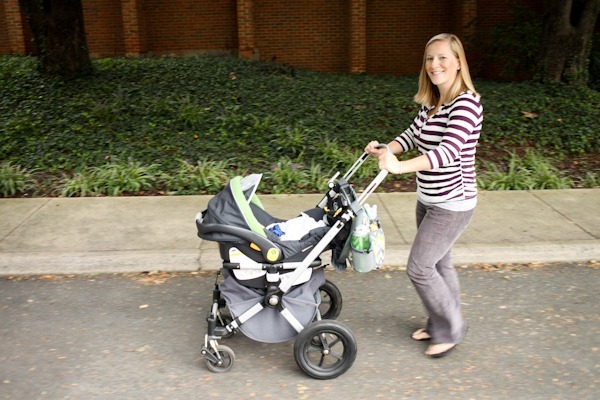 We wanted something petite to use for car trips and social outings and were very lucky to have been given the Buga. Otherwise I would have bought a Chicco travel system frame (and I still might actually because the Buga is a PAIN to get in and out of the car!) The BOB will be for when he grows into it – all things exercise. That makes sense! You know that you can put the carseat on the BOB, right? I think you need a special bar attachment. Also, the Baby Trend Snap and Go fits the Chicco carseat (that’s the set up we had for a while). Yeah, but it’s still huuuuuge. Not as ideal for shopping and things. That was our original plan : ) We didn’t know we were getting one until Matt’s dad surprised us recently though so we had already bought the car seat adapter for the Buga. Haha yeah, I know about cumbersome strollers because I had twins. 🙂 Am excited about having more (smaller) options if we have one next time. You’ll love the BOB. We had the single and now we’ve got the duallie, and even though they’re a bit bulky/heavy, I love them! Even at 6 months pregnant with number 3 (under 3), I keep the duallie in the car, ready to go. As for a pre-BOB stroller, we just stuck our infant seat in one of those super-bare-bones snap-and-go frames – super lightweight, zero bulk, does what you need it to. Hope you keep enjoying those walks – sounds like perfect weather. Yup, it will be much less of a hassle than the Bugaboo. 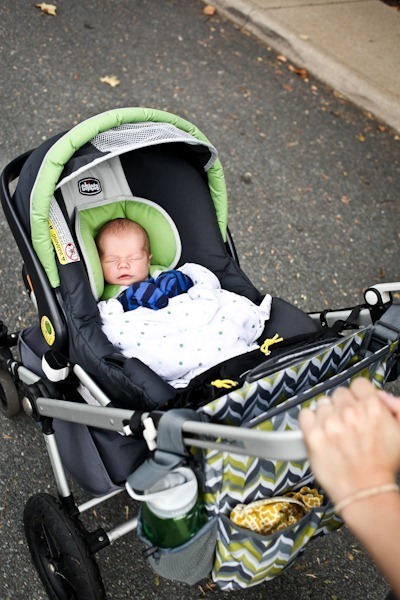 The frames are really easy and lightweight – there’s a bunch of models – snap n’ go is graco, there’s the baby trend one…and I’m sure the Chicco seat will fit in one, b/c it’s so standard/widely used. I would definitely get one of those snap ‘n go frames over a travel system. 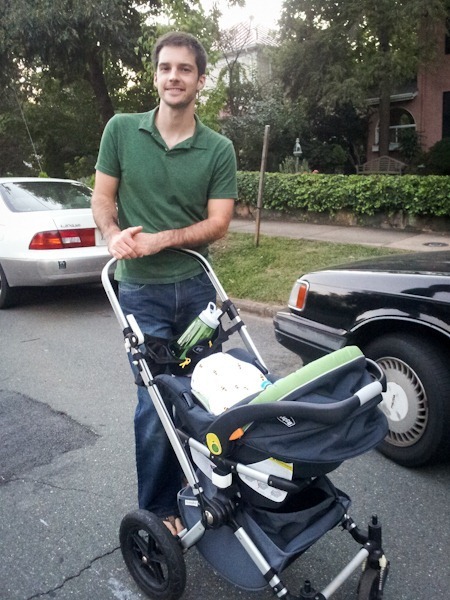 I sold our travel system stroller on Craigslist a few months ago because it is so big and bulky and just such a pain. I have a jogging stroller, but for non-jogging I use the City Mini. 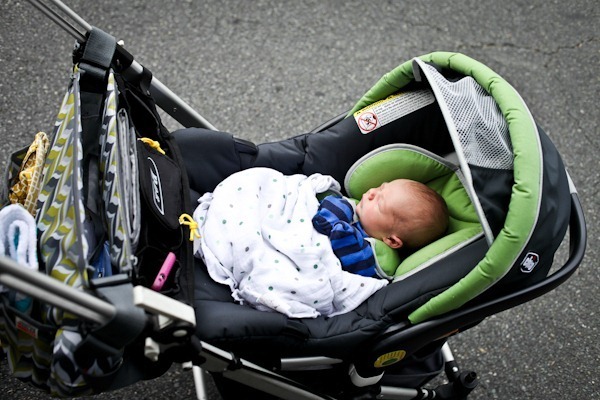 The City Mini is hands down best stroller out there for a reasonable price. You can also use a car seat adapter on it, which is what I’ll be doing for the next baby. Snap and go is what I meant to say… I get them confused! Get a snap n go – you will love it. It is just too easy to snap the car seat right in and take it out. Very very easy to use!! Yes! LOVE the CityMini. LOVE. I can collapse and set it up with my son in my left hand and wearing a diaper bag. Easy and light. Took it to Paris with us, too. Was great for travel. I find the Snap and Go too low down and not good for real walking (like hour long walks etc) bc of how I have to hold the handles to push. You look so beautiful. Do you know if your mom recovered as well as you have been so far and fit into her clothes so soon after? I am beyond impressed! Just made a variety of Dairy/Peanut/Tree Nut Pestos from my garden herbs…love the idea of brushing it over grilled veggies! You look AMAZING!! And Maze is adorable! Looks like a wonderful day! 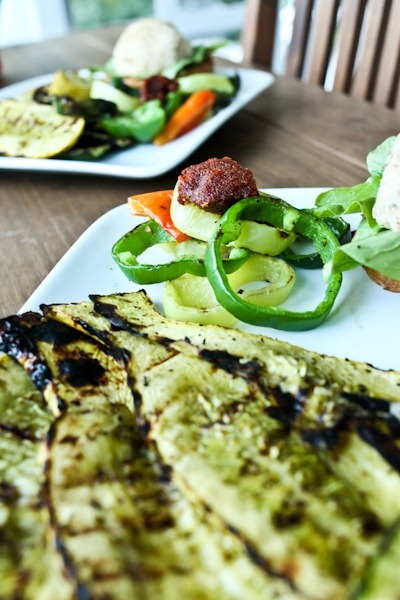 Grilled peppers with sun dried tomato pesto sounds awesome. You look fab! Just wondering why you’re not using the bassinet feature of the bugaboo? Lying flat is really the optimal position for a newborn as opposed to curled up in a carseat. 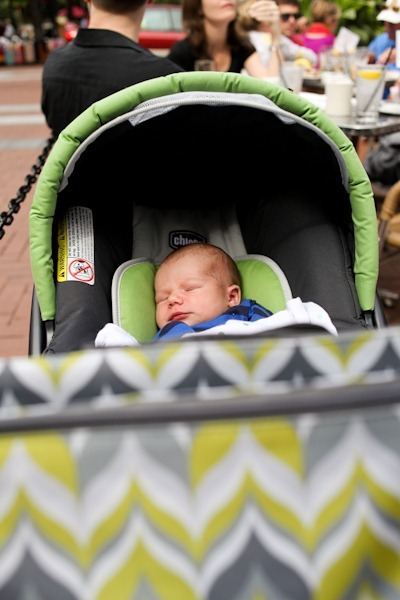 My little one would also go right to sleep in the stroller… then wake up the minute I stopped strolling. SMH! Now the same goes for the car seat. Welcome baby Mazen! Charlottesville is such an amazing place to grow up. Glad the chalkboard is still there! Now that we live in Alaska, our version of wild Alaska salmon is literally heading out to the nearest salmon stream in spawning season. Stream to table in about two hours! I’m sure the salmon burgers are great too– thanks for supporting domestic fisheries! Jealous! I had some great salmon in Seattle – I can’t imagine living right there! I was actually invited on a trip to Alaska – as part of the salmon marketing association actually – and I had to turn it down because it was the weekend of Mazen’s due date!! I was soooo sad, but I’m hoping I can go next year!? Burp face, brunch, salmon burgers—love it all! Definitely need to grab those at WF next time I’m there. You look awesome Kath! So happy and healthy! 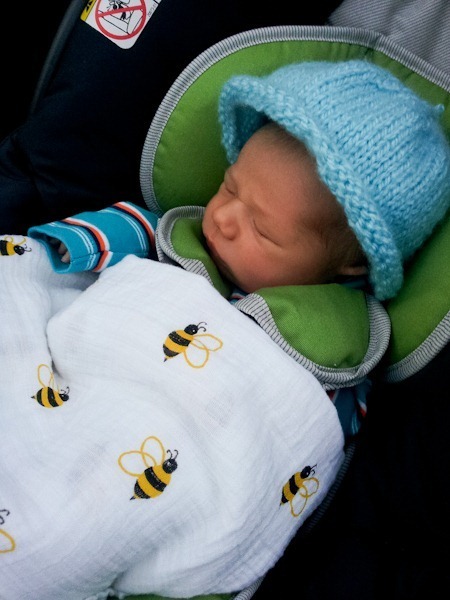 Love Maze’s bumblebee blankie. Super cute! 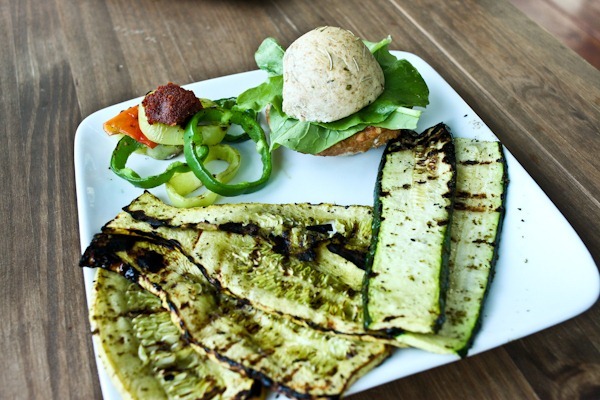 Grilled squash with pesto is the best thing in the world! One summer that’s all i would eat for lunch. Not balanced at all, but so so so delicious. Also, suuuper jealous of your weather. I keep waiting for that fall chill but I don’t think it will ever come here except for maybe in January. Ohhh Louisiana. Nice to see you out and about, I hate when I hear that people wont leave the house simply because they have a little one. On a side note, the CO gal in me is boggled when people are wearing fleece in anything over 40 degrees, but I also realize that others think its weird we wear shorts at 60 degrees. 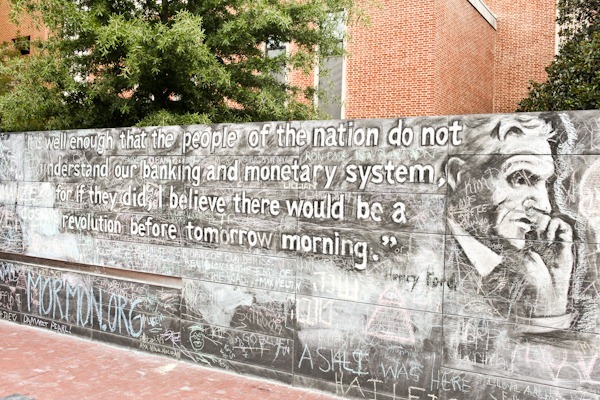 I really like the Henry Ford quote on the chalkboard. I wish more people would let that sink in and investigate what it means! Kath, You look amazing 11 days after giving birth!! Mazen is so adorable in the last photo! That belgian waffle looks so good! I have not visited your blog for quite a while. Didn’t know you already gave birth. Congratulations! Maze is a charming baby. And your meals, as usual, made me hungry. Are you planning to you a baby pouch? I’m not sure what that is? I have used it with both my kids and recommend it. We have one of those 🙂 Different brand – just haven’t used it yet. Are you guys arguing yet about who’s getting more sleep, who’s not getting enough??!! Lol! Maybe it’s still early…lol! My husband wasn’t the one who argued..it was me! What can I say, sleep was VERY important to me! lol! Glad you guys had a good weekend!! I’m not sure if you planned it, but in your pics it looks like everyone sans Matt is wearing stripes!